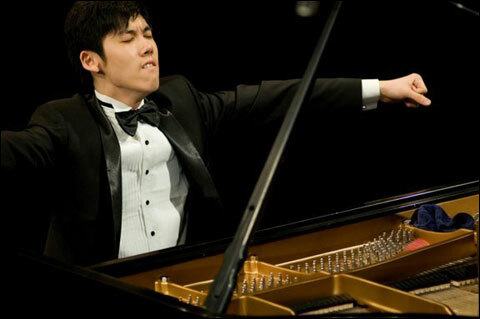 Born in Shanghai but studied at the Curtis institute with Gary Graffman, Haochen Zhang was awarded gold at the 2009 Cliburn Piano Competition, the youngest contestent that year. Now 24, Haochen has spent the past few years concertizing around the world and, I believe, finishing his education. Haochen has not released any studio recordings. The only thing I was able to find was one disc of his performances from the Cliburn competition featuring Stravinsky's Petrushka Suite, Chopin's Op.28 Preludes, some Liszt and a contemporary piece. Here is a 30-minute television show from Israel where he is interviewed in English and performs Liszt's Liebestraume, the third movement of Prokofiev's Sonata No. 7 and Schumann's Traumerei (There is also a clip of a Mozart concerto from the Cliburn). This is a clip of Haochen tearing up the first movement of Prokofiev's second concerto at the Cliburn. There are several other performances available on Youtube. Haochen seems to me to be a very intriguing but not quite fully realized prospect. What makes him intriguing is that he seems to have started in music from an unusual place--not romantic sentimentality but some kind of dry hyper-intellectualism. I pointed out the similarities with Glenn Gould in the "Surprise in Texas" thread. He has a tendancy to play literally and to bring out the percussive nature of the keyboard. But the Gould in him is not quite as pronounced or fleet as the original, and it seems to have been overlayed with its antithesis: a well-rounded, liberal, broadly-appreciative musical education. Nobody will ever say this is a bad thing, but I wonder if in this case the established norms of musical taste might have stifled what would have been a more interesting musical personality. 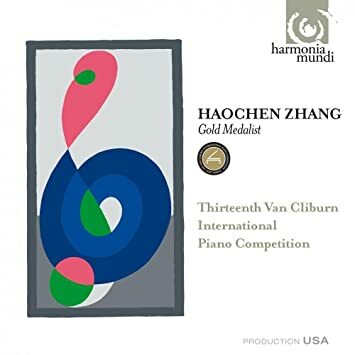 Haochen seems to gravitate towards oblique, off-beat works safely contained within the standard piano literature such as the Petrushka Suite, Liszt's Spanish Rhapsody, Gaspard de la Nuit, or Chopin's Polonaise-Fantasie. This is the album mentioned above. The other works he performed at the 2009 Cliburn are Beethoven's Op. 110 Sonata, Chopin's Polonaise-Fantaisie, Brahm's Variation and Fugue on a Theme by Handel Op. 24 (some 26 minutes, I don't think I've ever heard this), and Gaspard de la Nuit. As well as two concertos. The requirements for the Cliburn are insane. 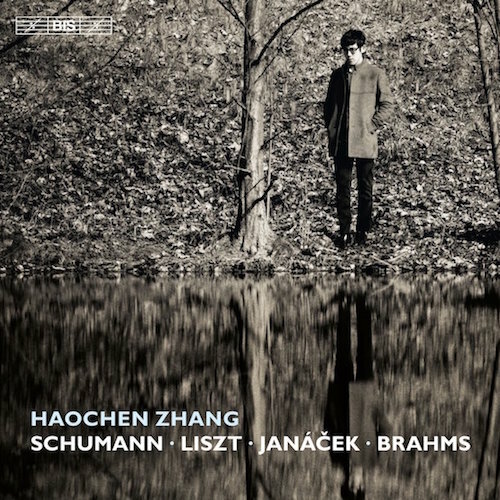 One day I will find copies of these other performances--or maybe just download them like the rest of society..
Haochen's Petrushka Suite is very good. It is rhythmically precise and intensely controlled. The level of control here seems to leave bare the basic absurdity of the work. Essentially devoid of sentimentality, this work plays to Haochen's inclination towards intellectual pianism, although he also has a romantic mode. The Chopin Preludes are more mixed. This is definitely an ambitious choice for a 19-year-old pianist, especially given the range of other works Haochen prepared for the competition. I already criticized his No. 16 Presto con fuoco, which was featured in "Surprise in Texas." He seems to be trying to retain digital clarity in the right hand at the expense of expressivity, and the left hand is somewhat stiff. Others, such as the thunderous No. 22 or the tempestuous No. 8, also suffer from over-control. In some places, you get some unexpected insight, such as the detail in the left hand of No. 3 or the sparkle in the right of No. 10. But this set leaves little impression except that of competence. It is technically proficient and tastefully articulated, but sounds a little bit like maybe your favorite 5 performances of the Preludes blended by a computer algorithm, their individuality ironed into a flat, even surface. Some of this probably has to do with Haochen's youth--the Preludes contain a infinite trove of tints and shades of emotion, which no 19-year-old has had time enough to experience and identify with. I have found the same thing in some of Haochen's other perfomances: he tends to slow down and sing main lines in the exact same way to convey "emotion." Either age and experience will help him fill out and qualify what "emotion" means, or he should just stick to being a cerebral, intellectually-driven interpreter a la Gould. The contemporary work "White Lies for Lomax" by Mason Bates (composer in residence at the Chicago Symphony Orchestra) is an upbeat jazz-inspired work with a dotted rhythm and interesting trailing repetitions in the upper register. Haochen plays it extremely well, if slightly impersonally. In the Spanish Rhapsody, you get more of the same mix of literality and well-coached taste. Individually, Haochen's performances are at a very high level. But after spending some time with him, you want him to choose a direction, to stop straddling the fence. It will be very interesting to see how he develops. Rachmaninoff’s Third Piano Concerto, written for the composer’s first American tour in 1909, shares with the Second Concertos of Bartók and Prokofiev the dubious distinction of being the most technically challenging of the standard repertory. Many pianists come to grief attempting to articulate the exquisite poetry that lies concealed beneath Rachmaninoff’s incessant, almost impenetrable barrage of notes. Haochen Zhang is not one of them. His performance was not entirely perfect. There were times, when the orchestra had the lead, you wished he would simply accompany, rather than pointing up interesting supporting harmonies and figurations. That said, Zhang, at 24, has all the qualities of a great Rachmaninoff interpreter. He can execute warp-speed passages in a whisper, release great surges of energy, command a stentorian sound when things get heroic and, above all, spin out a golden singing line with aristocratic restraint. Zhang’s demeanor at the instrument is poised, relaxed, almost serene. Then, when you least expect it, as in the first-movement cadenza, it’s as though the mouth of hell has opened up, flames leap from the piano strings and the odor of sulfur fills the air. Zhang’s dazzling playing is without gimmick or ostentation. [I love how all Western music critics include this line in their reviews of Asian pianists now--Lang Lang casts a long shadow] His imagination is what keeps you on the edge of your seat and breathless to hear what comes next. Pianist, conductor and orchestra achieved a rare hand-in-glove sense of ensemble. The instantaneous, vocal standing ovation was as inevitable as it was deserved. The first encore was pure Cirque du Soleil—Arcadi Volodos’s Turkish March (Mozart) transcription. His hands a blur, Zhang played it altogether as well as and a bit faster than Volodos, and, for those keeping score, notably better than either Lang Lang and Yuja Wang. (Shots fired! )By the end (talk about splintering) it was not unlike the Donald-Daffy Liszt duel in Roger Rabbit, and thus should become a competition mandatory, I say. The second encore was the profoundly aching Brahms Intermezzo Opus 18 no. 2 in a rendition that, for my mood, was just too perfect and pretty, after all that had gone before. Zhang’s first official release is a carefully curated and exquisitely played bouquet of safe to middle-safe Germano-Hungarianish Romanticism on the Swedish label BIS. As I suspected from listening to his Cliburn performances in ’09, his style of playing translates very well to the recorded medium. He is a very patient and cerebral performer who seems to conceive of the sound of the piano at the level of the microphone as opposed to that of the concert hall. Regarding repertoire, Zhang has always tended to look under stones in the garden of the standard repertoire, and this album is no different. Except for Kinderszenen, none of the works are at the top of the playlist for their respective composers, although all of the composers are familiar names. The heart of this album is the Liszt Ballade and the Janacek Sonata. Ballade No. 2 begins with an almost purely atmospheric chromatic sine-wave motif that gradually gives way to the somber and stately subject introduced above it, contrasted with a syncopated and spritely B section. Roughly eleven minutes in the path clears and the subject emerges bathed in grandiosity and free of the turbidity and hesitance of its development—a classic setup and delivery. The Janacek is surprisingly forward-looking, with a cosmopolitan first movement and a second movement titled “Smrt” (death) that presages the de facto monophony of much later 20th century and contemporary music. The Kinderszenen is clean, responsive and sympathetic. Zhang tends to be more interesting in the faster selections than in the better-known slower ones, but the overall reading is solid. Of the works on this album, the Brahms Intermezzi are the only ones that seem interpretively underdeveloped. They fit the theme of the album well, but the performances sound flat on their own. To judge by the liner notes, the theme of this album is “introspection.” The notes are littered with allusions to it—intimacy, reflective, introspection, inward-looking, introverted, inner emotions, meditative, retrospection. Whoever’s idea this was, the music on this album can more accurately be described as “introverted,” not necessarily introspective. For me, introspection is the self-searching that comes as a result of experience, of the trial and suffering of life. The quality that Zhang is referring to here is constitutional, aloof, untested. This is also the album’s greatest weakness: it looks inward without having something to look at. It is competent, tasteful playing, but in the end the listener is left where he began—with notes on a page.